The assignment: To use the inspiration from the Gallery Walls Pinterest board and make a page that is your gallery wall. 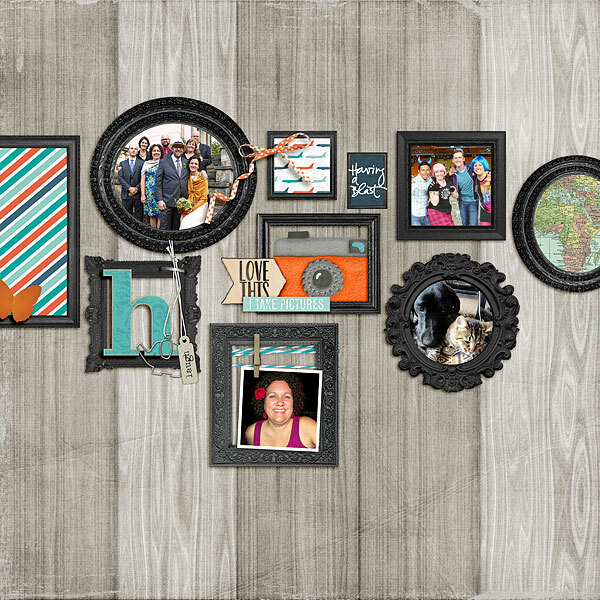 Do not use the layout of a gallery wall as your inspiration for placement for an event or everyday life page. Rather use these eclectic gallery walls to inspire a page that reflects you and looks cool and eclectic. I started on this right after getting our assignments, but think that it was the last assignment that I submitted because I got stuck creatively on how to finish. Part of that was a result of seeing other submissions from the team and how much more creative they were! From one of the pins on Pinterest I read that one tip for creating a gallery wall was to use frames that are all the same color. So I started by finding all my dimensional frames in black and then placing them on the page. For background paper I decided on a woodgrain paper that has a realistic look. Once I had the frames placed where I wanted I started filling in the content. I used a map of Africa and pictures of my family, friends & animals. I used the plane patterned paper to represent my love of travel & filled a frame with I noticed from the inspiration gallery that many gallery walls used initials, so I put mine inside a frame. The “Having a Blast” word art represents pretty well how I feel about my life on a day-to-day basis.